We need true tax reform that will at least make a start toward restoring for our children the American Dream that wealth is denied to no one, that each individual has the right to fly as high as his strength and ability will take him. It is the march of freedom and democracy which will leave Marxism- Leninism on the ash heap of history as it has left other tyrannies which stifle the freedom and muzzle the self-expression of the people. I hope that when you are my age, you will be able to say as I have been able to say: We lived in freedom. We lived lives that were a statement, not an apology. We've been tempted to believe that society has become too complex to be managed by self-rule, that government by an elite group is superior to government for, by, and of the people. Well, if no one among us is capable of government himself, then who among us has the capacity to govern someone else? You can tell a lot about a fellow's character by his way of eating jellybeans. Ravi: uh .. how so? Freedom is the recognition that no single person, no single authority or government has a monopoly on the truth, but that every individual life is infinitely precious, that every one of us put in this world has been put there for a reason and has something to offer. Life is just one grand sweet song, so start the music. Some of your countrymen were unable to distinguish between their native dislike for war and the stainless patriotism of those who suffered its scars. But there has been a rethinking and now we can say to you, and say as a nation, thank you for your courage. Trust the people. This is the one irrefutable lesson of the entire postwar period contradicting the notion that rigid government controls are essential to economic development. Government does not tax to get the money it needs; government always finds a need for the money it gets. America is no stronger than its people - and that means you and me. Well, I believe in you, and I believe that if we work together then one day we will say, "We fought the good fight. We finished the race. We kept the faith." And to our children and our children's children we can say, "We did all that could be done in the brief time that was given to us here on earth." A government bureau is the nearest thing to eternal life we'll ever see on this earth. Are you entitled to the fruits of your labor or does government have some presumptive right to spend and spend and spend? I had a dream the other night. I dreamed that Jimmy Carter came to me and asked why I wanted his job. I told him I didn't want his job. I want to be President. The thought of being president frightens me. I do not think I want the job. You and I are told we must choose between a left or right, but I suggest there is no such thing as a left or right. There is only an up or down. Up to man's age-old dream -- the maximum of individual freedom consistent with order -- or down to the ant heap of totalitarianism. I think the best possible social program is a job. We who live in free market societies believe that growth, prosperity and ultimately human fulfillment, are created from the bottom up, not the government down. Only when the human spirit is allowed to invent and create, only when individuals are given a personal stake in deciding economic policies and benefitting from their success -- only then can societies remain economically alive, dynamic, progressive, and free. The greatness of our country has been based on our thinking that everyone has a right even to be wrong. The West will not contain Communism, it will transcend Communism. We will not bother to denounce it, we'll dismiss it as a sad, bizarre chapter in human history whose last pages are even now being written. There are some who've forgotten why we have a military. It's not to promote war; it's to be prepared for peace. I believe the highest aspiration of man should be individual freedom and the development of the individual. 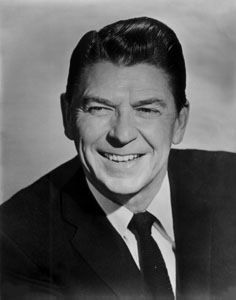 76 quotes by Ronald Reagan.